Trafalgar Square is a public space and tourist attraction in central London, England, United Kingdom built around the area formerly known as Charing Cross. It is in the borough of the City of Westminster. At its centre is Nelson's Column, which is guarded by four lion statues at its base. There are a number of statues and sculptures in the square, with one plinth displaying changing pieces of contemporary art. The square is also used for political demonstrations and community gatherings, such as the celebration of New Year's Eve. The name commemorates the Battle of Trafalgar (1805), a British naval victory of the Napoleonic Wars over France. The original name was to have been «King William the Fourth's Square», but George Ledwell Taylor suggested the name «Trafalgar Square». In the 1820s, George IV engaged the architect John Nash to redevelop the area. Nash cleared the square as part of his Charing Cross Improvement Scheme. The present architecture of the square is due to Sir Charles Barry and was completed in 1845. The square consists of a large central area with roadways on three sides, and a terrace to the north, in front of the National Gallery. The square was formerly surrounded by a one-way traffic system, but works completed in 2003 reduced the width of the roads and closed the northern side to traffic. Nelson's Column is in the centre of the square, flanked by fountains designed by Sir Edwin Lutyens in 1937-9 as replacements for two earlier fountains of Peterhead granite (now in Canada), and guarded by four monumental bronze lions sculpted by Sir Edwin Landseer. The column is topped by a statue of Horatio Nelson, the vice admiral who commanded the British Fleet at Trafalgar. On the north side of the square is the National Gallery and to its east St Martin-in-the-Fields church. The square adjoins The Mall entered through Admiralty Arch to the southwest. To the south is Whitehall, to the east Strand and South Africa House, to the north Charing Cross Road and on the west side Canada House. Barry was unhappy about Nelson’s column being placed in the square. In July 1840, when its foundations had already been laid, he told a parliamentary select committee «it would in my opinion be desirable that the area should be wholly free from all insulated objects of art». Nelson’s Column (in the picture) had been planned independently of Barry’s work. 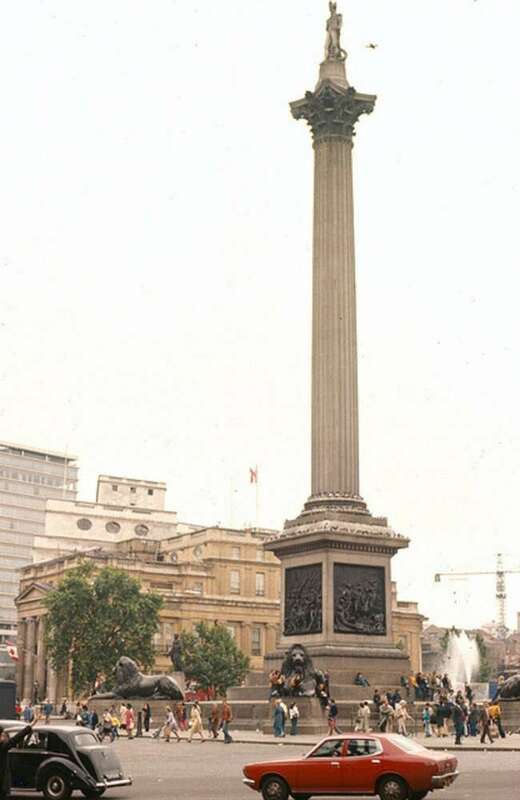 In 1838 a Nelson Memorial Committee had approached the government, proposing that a monument to the victor of Trafalgar, funded by public subscription, should be erected in the Square, and the government had provisionally agreed. A competition was held, the winning design, by the architect William Railton, being for a Corinthian column topped by a statue of Nelson, with an overall height of more than 200 feet, guarded by four sculpted lions. The design was approved, with the proviso that the overall height should be reduced to 170 feet, and construction began in 1840. The main construction of the column was completed, and the statue raised, in November 1843. However, the last of bronze reliefs on the pedestal of the column was not installed until May 1854, and the four lions, although part of the original design, were only added in 1867. Barry's scheme provided two plinths for sculptures on the north side of the square. A bronze equestrian statue of George IV by Sir Francis Chantrey, originally intended for the top of the Marble Arch, was installed on the eastern one in 1844, while the other remained empty until the late twentieth century. Two more statues on plinths were added during the nineteenth century; General Sir Charles James Napier by George Cannon Adams in the south-west corner of the square in 1855, and Major-General Sir Henry Havelock by William Behnes, in the south-east in 1861. In 2000, the then Mayor of London Ken Livingstone controversially expressed a desire to see the two generals replaced with statues of people «ordinary Londoners would know». Since 1998 the empty plinth in the north-west corner of the square — which has become known as the «Fourth Plinth» – has been used to show a series of specially commissioned artworks. The scheme was initiated by the Royal Society of Arts and continued by a Fourth Plinth Commission, appointed by the Mayor of London. A 1:30 scale replica of HMS Victory in a giant glass bottle by Yinka Shonibare was installed on the plinth in May 2010. When the square was laid out in the 1840s, the fountains' primary purpose was not aesthetic, but rather to reduce the open space available and the risk of riotous assembly. They were originally fed by water pumped from an artesian well by a steam engine sited behind the National Gallery. In the late 1930s it was decided to replace the stone basins and the pump. The new fountains were built to a design by Sir Edwin Lutyens at a cost of almost Ј50,000. 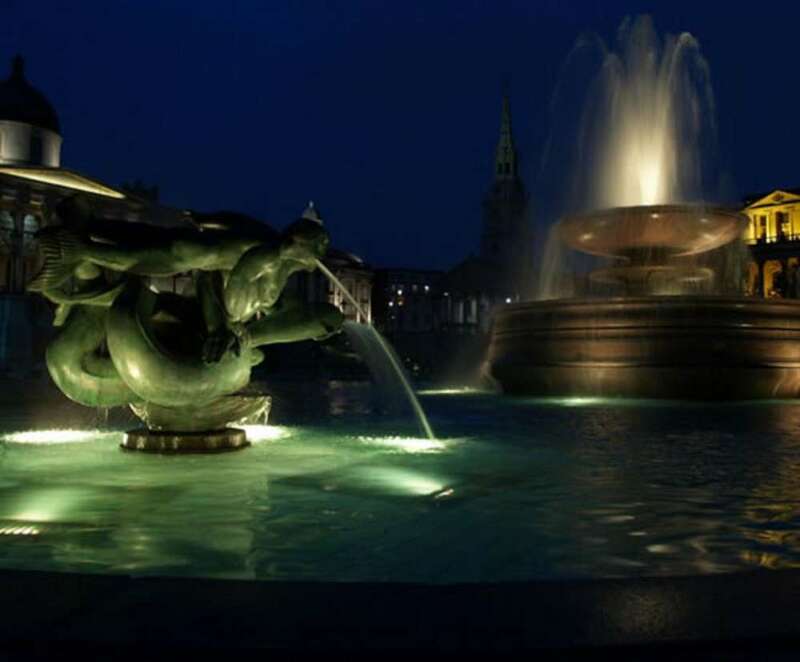 The old fountains were bought for presentation to the Canadian government, and are now in Ottawa and Regina. The present fountains are memorials to Lord Jellicoe (western side) and Lord Beatty (eastern side). Further restoration work became necessary and was completed by May 2009. The pump system was replaced with a new pump is capable of sending an 80-foot (24 m) jet of water into the air. A new LED lighting system (picture 1, picture 2) was also installed during this restoration to reduce the cost of lighting maintenance. 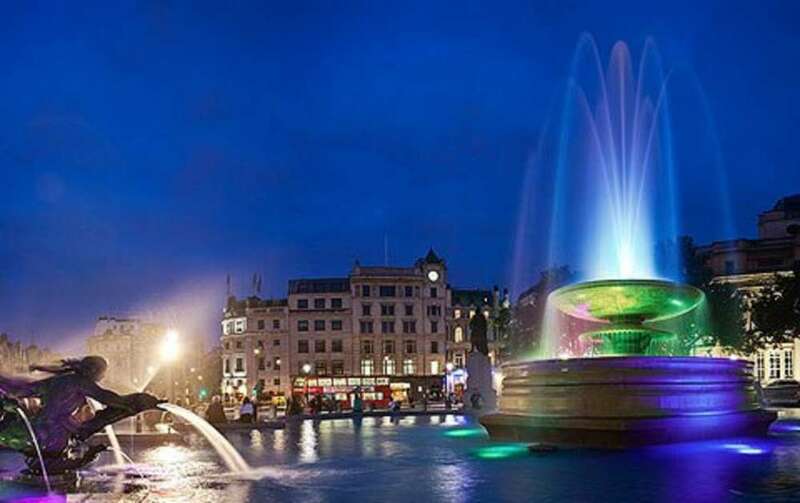 The new lighting has been designed with the London 2012 Summer Olympics in mind and for the first time will project many different combinations of colours on to the fountains. The new lighting system has a much lower energy requirement and will reduce its carbon footprint by around 90%. For many years, revellers celebrating the start of a New Year have gathered in the square, despite a lack of civic celebrations being arranged. The lack of official events in the square was partly because the authorities were concerned that actively encouraging more partygoers would cause overcrowding. Since 2005, a firework display centred on London Eye and the South Bank of the Thames has been provided as an alternative. Victory in Europe Day (VE Day) was 8 May 1945, the date when the Allies during the Second World War celebrated the defeat of Nazi Germany. Trafalgar Square was filled with a crowd wanting to hear the formal announcement by Sir Winston Churchill that the war was over. The square was also used as a place of celebration by people travelling there from all over the country. On 8 May 2005 the BBC held a concert to celebrate the 60th anniversary of VE Day. 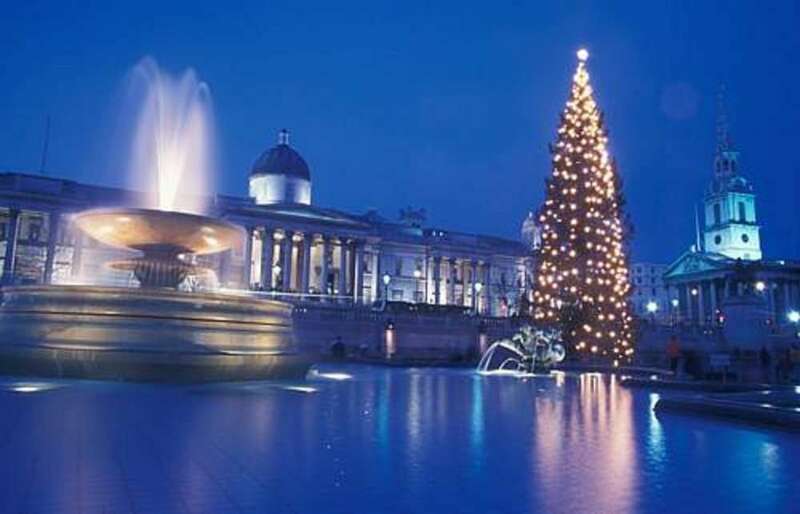 There has been a Christmas ceremony at Trafalgar Square every year since 1947. A Norway Spruce is given by Norway's capital Oslo and presented as London's Christmas tree, as a token of gratitude for Britain's support during World War II. (Besides the general war support, Norway's Prince Olav, as well as the country's government, lived in exile in London throughout the war.) As part of the tradition, the Lord Mayor of Westminster visits Oslo in the late autumn to take part in the felling of the tree, and the Mayor of Oslo then comes to London to light the tree at the Christmas ceremony. Since its construction, Trafalgar Square has been a venue for political demonstrations, though the authorities have often attempted to ban them. The 1839 fountains were added on their current scale to reduce the possibility of crowds gathering in the square as they were not in the original plans.